This course provides an opportunity at master's level for recently graduated engineers and technical specialists to deepen the knowledge and skills gained in their first degree while expanding their managerial and professional engineering knowledge. The course is designed to allow students to gain in-depth knowledge and skills in the particular major that they undertook as part of their undergraduate engineering studies. The subjects offered follow an integrated approach to professional practice through compulsory disciplinary and professional engineering subjects, compulsory subjects relevant to the chosen major, an independent engineering graduate project in at least one field of engineering, and a set of electives (any engineering or IT subjects, some with prior approval). Students also have the option of not electing a major. It is a requirement that the bachelor's degree be in engineering and relevant to the applicant's proposed major, with no more than 25 per cent of subjects failed. Applicants are assessed individually for recognition of prior learning, up to a maximum of 24 credit points, based on relevant tertiary qualification(s). Applicants given maximum recognition of prior learning complete the course in one year (full time) or two years (part time). This course is offered on a one-year, full-time or two-year, part-time basis for applicants with a UTS-recognised bachelor's degree in engineering. For applicants without recognised qualifications, it is offered on a one-and-a-half-year, full-time or three-year, part-time basis. Candidates complete coursework subjects and an independent engineering graduate project, totalling 72 credit points of study. The project component consists of a preparatory subject and a project (in the area of the major) and is typically undertaken after completing one session's worth of coursework. Some postgraduate program majors may require students to complete a number of prescribed subjects with or without opportunity for electives. Subjects are selected from postgraduate programs offered by the Faculty of Engineering and Information Technology. 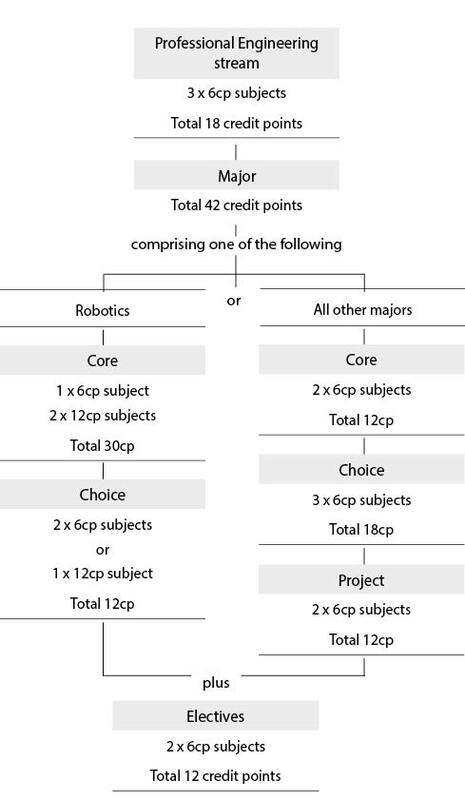 A major is granted if subjects worth 42 credit points (including the project component) are completed within a particular postgraduate program major. The sample program below shows a suggested sequence of subjects for the Civil Engineering major for a full-time student commencing the course in Autumn session. Students in other majors follow a similar sequence. The program is intended as a guide only and does not take into account such factors as recognition of prior learning, changes in attendance mode and subject availability, or satisfactory academic progress. Students should consult the Timetable Planner to confirm the availability of subjects in the current academic year. This course is part of an articulated program comprising the Graduate Certificate in Engineering (C11236), the Graduate Diploma in Engineering (C06108), the Master of Engineering, the Master of Engineering (Extension) (C04277) and the Master of Engineering (Advanced) (C04278).